Myanmar, still often referred to as Burma, encompasses diverse landscapes – from its Andaman Sea coastline to the snowy peaks of the Eastern Himalayas located on its north shoulder. One of Southeast Asia’s largest countries, Myanmar was once the center of a great empire that swept as far north as Tibet and south to Bangkok. The commanding Ayeyarwady (Irrawaddy) River with its vast delta is one of the main rice-growing regions of the world. The center encompassed the now sleepy town of Bagan, where as many as 13,000 temples and pagodas are said to have existed. Today’s landscape remains dotted with thousands of temple ruins. 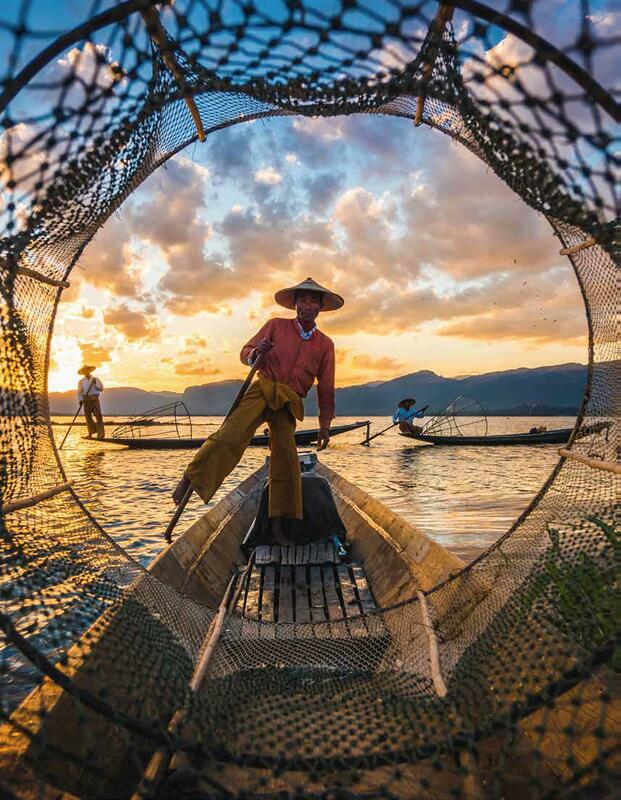 The country’s rich ethnic diversity is represented in the more than 100 languages spoken by its ethnic minorities such as those in the villages of Inle Lake, where travelers witness a way of life that is rapidly vanishing elsewhere. The country’s culture is primarily based on Theravada Buddhism. Myanmar is just beginning to come into its own as an international destination with outstanding five-star properties, boutique hotels, and mountain and beach resorts. The many fascinating facets of Myanmar combine to create a complex and thoroughly captivating destination. It’s about six in the morning, in the golden glow of early light, and they come. The Buddhist monks and novices empty onto the narrow streets, and as is the custom, the distinctive red robes are purposefully arranged over both shoulders. Traditionally, the monks from very young boys to the tall and slender older men line up in order of their seniority by ordination date. Barefoot and single file, the monks joined nuns begin their ritual walk through the village with their offering bowls, seeking alms. An older woman stands quietly on the side of the road, waiting. As each person passes, she wordlessly scoops out a spoonful of rice from her pan and gently, reverently spoons it into each bowl. This sacred exchange has been reenacted daily for some 2,500 years. The Buddha believed the monks and nuns should not cook their own food. They should be free of worldly tasks so they would have to depend on the generosity of others, and therefore remain humble. Explore Myanmar's rich tapestry of ancient temples, villages and cultural traditions. Experience the extraordinary Bagan temple site from two unique perspectives - by hot air balloon and by bicycle! Hot air ballooning over Bagan's ancient temples; some 800 tropical islands in the Andaman Sea; the Irrawaddy River, the bloodline of the nations and the stilt villages of Inle Lake are but a taste of all that Myanmar has to offer. Experience Myanmar’s spectacular Bagan dotted with thousands of 800-year-old temple ruins. Explore Cambodia’s fabled Angkor Wat and Koh Ker sites. Discover Loas’ rural towns and villages, home to some of the region's last traditional cultures. This adventure stirs the imagination of travelers willing to take in new experiences.